So, about the last couple of weeks….It’s hard to take how divided we are right now. And it’s hard to believe that the toxic tone and approach to politics, which would’ve been unthinkable not so long ago, is now perfectly acceptable. In such a short period of time, we seem to have lost the sense of shared responsibility and have abandoned longstanding democratic norms in the name of party over country. But I have faith that we’ll get through this together. I have a lot of hope knowing that so many women, in particular, have renewed their extraordinary commitment to justice and call to action. Really, it’s time for all of us to be committed and ready to act, including the men who respect and support those women. For me, I find significant comfort in working with some deeply effective, true public servants. My Senate staff and I spend a lot of time together, year in and year out, but particularly in odd-numbered years. We learn from each other, rely on each other, cheer for each other and value each other, professionally and personally. We’re family. I depend on them a bunch, and thank them for helping me as I try to be the senator I want to be. Two members of that family have logged some real time. This month, Sarah Howard and Sandy Guzman will have been with me in the Senate for at least a decade now. Sarah is my Chief of Staff. She started as my scheduler in 2006 and worked her way up to the top job of running the Senate office. I first met Sarah back in 2005 when I was the chair of the board for an association and she was the staff person who had to keep everything organized. I was impressed and, as I was coming into the Senate, I asked her to help me. Her ability to organize, anticipate needs and make things happen is exceptional. She makes sure things get done and done well. She’s been key to creating an office that’s open, disciplined, works collaboratively and is responsive to everyone. Sandy’s title is Legislative Director, but that doesn’t begin to describe her responsibilities over the past decade. I’ve turned to her to spearhead all of my big, complicated community projects over the years: 10 Goals in 10 Years that led to the Dell Medical School and so much more, including our ongoing efforts to redesign the Austin State Hospital, and the whole brain health continuum of care; homelessness; and anything and everything related to transportation. Sarah Howard (center) and Sandy Guzman with me on the Senate floor. And it really is a team effort. Keysha Walcott, our Constituent Services Manager, works every day to help folks navigate state agencies to get the services they need and deserve, and she does it with incredible empathy and compassion. General Counsel Kelsey Erickson is often the brain behind many of my best of legal arguments on the Senate floor. Kate Alexander is the Policy Director. 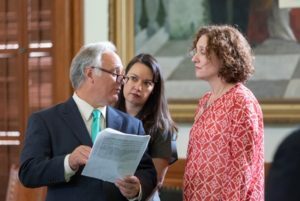 There are few people in the Capitol that know more about the Texas budget, and she’s a master at researching issues and helping synthesize information so that we’re always on top of the latest thinking and policy options. Stephanie Chiarello, who has run the Kirk Watson Campaign Academy for years, also gets deep in the weeds on healthcare policy and once helped a constituent in Indonesia get a ride to the U.S. Embassy with a little creative thinking. And Gladys Acosta, who graduated from the University of Texas at age 19, joined our office last year straight out of school and, let’s just say, we’ll all be working for her one day. We also have two new great additions to my office — Kerrie Judice and Brandon Garcia — and I’m thrilled to have them as part of my policy staff for the upcoming legislative session. All of these folks serve the people of this Senate District and the whole state through their hard work and dedication. They’re true public servants, and I’m proud to work with them every day. If you want to cast a ballot in the November election, tomorrow is the last day to register to vote. And double-check if you recently registered online through the website Vote.org because there’s a question about the validity of your registration. Needless to say, elections have consequences. We’ve seen that in stark reality of late. I’m just sick about the direction our country is going but know that the people who can turn it around are those who choose to vote. My 13th annual Concert Under the Stars is almost here. I’d love to see you Wednesday night in Zilker Park featuring Shakey Graves. Get tickets here.